Here’s what’s up in the world of TV for Monday, June 25. All times are Eastern. 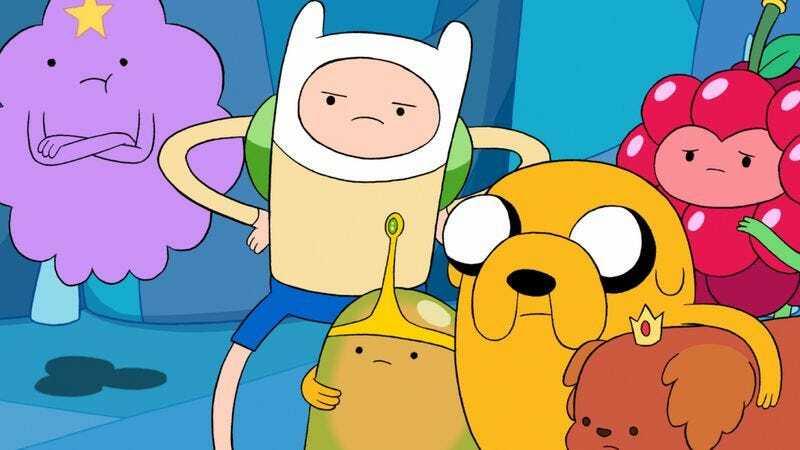 Adventure Time (Cartoon Network, 7:30 p.m.): The weekly adventures of Finn and Jake offer a half-hour window into childhood for Adventure Time’s adult viewership—and that’s especially true during the summer months, when an excursion like tonight’s quest to rid the Candy Kingdom of an evil cookie serves as a responsibility-free link to summer vacations of yore. You may have to go to work in the morning, but you can build a blanket fort with Oliver Sava in the comments section tonight. Bunheads (ABC Family, 9 p.m.): Erik Adams has to step out for the night, leaving a TV Club contributor to be named later to drop in on Paradise as new tensions arise between Michelle and Franny. But will that substitute clap with the same amount of joy if Ellen Greene’s character shows up? The West Wing (11 a.m.): Steve Heisler is proud to be your counselor at “Debate Camp,” where incumbent presidents prepare to smite the competition, and everyone enjoys a good flashback around the campfire. Batman: The Animated Series (1 p.m.): The series wrings the last bit of pathos out of Mr. Freeze, as a Walt Disney surrogate tasks Victor Fries with discovering the frozen key to immortality. Oliver Sava suggests you bring a sweater. Strangers With Candy (3 p.m.): The plot of this week’s episode, “Who Wants Cake?,” is a holdover from the original Strangers With Candy pilot. Presumably, Comedy Central didn’t want to introduce a new series by having its protagonist go on a witch hunt for the mentally retarded. In a curious coincidence, Witch Hunt For The Mentally Retarded is the name of Meredith Blake’s new grindcore band. Breaking From Above (TeenNick, 8:30 p.m.): Without a Destiny’s Child to endlessly retool in ways that put an increasingly large spotlight on his daughter, Matthew Knowles turns his attention to U.K. vocal group From Above—which (surprise!) he motivates by turning this reality show into an audition for two potential replacement members. Me @ The Zoo (HBO, 9 p.m.): Reaching past “Leave Britney Alone!,” Chris Moukarbel and Valerie Veatch’s profile of vlogger Chris Crocker paints a portrait of a surprisingly shrewd Internet personality and the online community that brought him to fame/infamy. Nathan Rabin caught the documentary at Sundance, and he’ll post an extended review later in the day. Extreme Couponing (TLC, 10 p.m.): Another season of TLC’s cost-cutting reality show comes to an end, but don’t fret for the participants—they have more than enough discounted canned goods to make it through the harsh hiatus months. Meatballs (IFC, 8 p.m.): Before he was a maniacal greenskeeper, a Ghostbuster, an unstuck-in-time meteorologist, a cuckolded neurologist, or the president of the United States, Bill Murray inspired a generation of slobs with four simple words: “It just doesn’t matter.” Three decades on, Meatballs still matters, though. Mean Girls (E!, 9 p.m.): Dear Tina Fey: Now that 30 Rock’s coming to a close, what are the chances you’re ready to write another movie as sharp, satirical, and unexpectedly warm as this one? Maybe one with room for a Lizzy Caplan performance? Sincerely, The A.V. Club. College World Series: Game 2: Arizona vs. South Carolina: Either the “ping” of the metal bats will resound throughout Omaha for one more game, or the Wildcats will bring the championship back to Tuscon. Either way, we’re going to miss the jarring sound of leather meeting aluminium. The Great Escape: Scott Von Doviak says the new reality-competition series from the producers of The Amazing Race looks like a lot of fun to play—so, as a follow-up to that declaration, we’ve stranded him in a cell on Alcatraz Island. Will he make it out in time to review Burn Notice on Thursday? Stay tuned to find out.